Although there are plenty of white peonies on the market, few of them are as special Dr. F. G. Brethour. 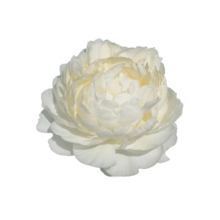 This beautiful and exclusive peony emits a lovely fragrance and has perfectly round buds that bloom into exquisite, white flowers with the tiniest hint of yellow in the centre. Dr. F. G. Brethour is a double-flouwered peony that blooms in the shape of a rose. The perfectly round buds open up to lush, white flowers. It’s a sight to behold! This variety has coarse leaves and big, strong stems that are strong enough to carry the weight of the heavy flowers. This peony variety was bred by Henry Sass, who also bred the white peony variety Elsa Sass. Dr. F. G. Brethour is lesser-known, but certainly not less beautiful. The variety was registered in 1938. Availability of Dr. F. G. Brethour will be limited the next years, so order on time if you don’t want to miss out! We do expect to have larger quantities in stock as soon as 2021. Just like Elsa Sass, it is essential that Dr. F. G. Brethour is harvested at just the right moment. When cut too soon, this peony will certainly fail to bloom. Only buy Dr. F. G. Brethour if the bracts are loose and the inside of the bud is starting to turn white.